All Your Questions about the Busby Family from TLC’s “OutDaughtered” Answered Right Here! 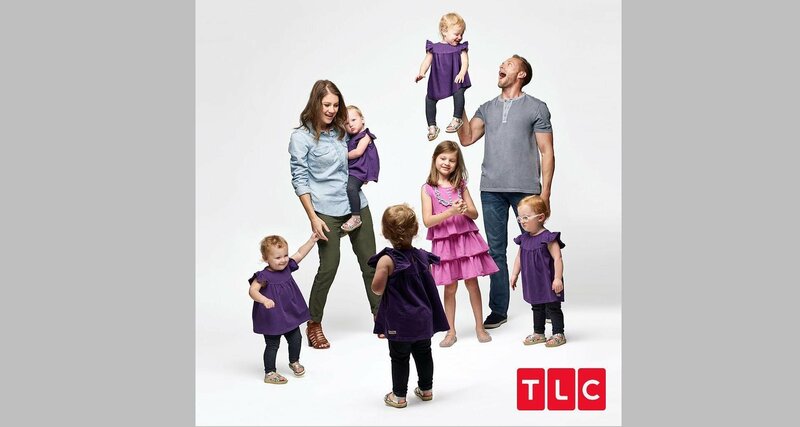 TLC’s OutDaughtered is a show about the only all-female quintuplets born in the U.S. Parents Danielle and Adam Busby have their hands full with the girls, including their first daughter Blayke! Here are some FAQs for fans of the show. The Busby family hails from Lake Charles, Louisiana, but moved to League City, Texas. The filming of the reality show takes place in the enormous Busby home there. 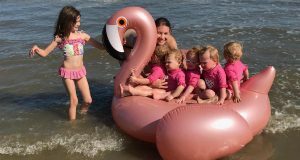 How Old are the OutDaughtered Quints? They are all three years old and were born on April 8, 2015. Where Were the Busby Quints Born? The Busby quints were delivered via C-section by Dr. Alexander Reiter at The Woman’s Hospital, in Houston, Texas. They were only 28 weeks and two days old when they delivered by mother Danielle Busby. Which Busby Babies Are Twins? Ava Lane and Olivia Marie Busby are identical twins. The other three girls are fraternal. How Old Are Adam and Danielle Busby? Adam Busby was born on June 10, 1982, which makes him 36 years old. Meanwhile, Danielle Busby was born on December 23, 1983, making her age 34. What Are the Names of the Quintuplets? The quints are named Ava Lane, Hazel Grace, Olivia Marie, Parker Kate, and Riley Paige Busby. They have a seven-year-old sister, Blayke Louise Busby, who was born on April 5, 2011. What Do the OutDaughtered Parents Do for a Living? Adam Busby is a key account manager at Intrinsic Solutions/Sprint Safety. He has been working there for over 11 years. Danielle Busby is an independent beauty consultant who also runs the blog, It’s a Buzz World. She’s a fitness lover and co-owns Rush Cycle in League City, which is an indoor spinning and cycling class. Are the OutDaughtered Parents Still Together? Yes, Adam and Danielle are still together and very much in love with each other. They stand strong as a duo, and their vlogs on YouTube prove it! It appears that the family just took a vacation about a two weeks ago, and the mom and pop of the Busby household looked like they were enjoying their life to the fullest! You can head on over to Danielle’s Instagram page (@dbusby) to see the loving family through her eyes. Did the OutDaughtered Parents Do IVF? No, they did not. The Busby’s struggled with infertility during both pregnancies, but according to the personal blog, the children were conceived through artificial insemination (AI). But after some drug changes and a tough decision to not have IVF because of the high costs, the couple got pregnant with their first child. The same process was followed for the quintuplets as well. However, Adam was not required to be on drugs as his sperm motility was checked to be okay. Danielle, on the other hand, had to go back on drugs. 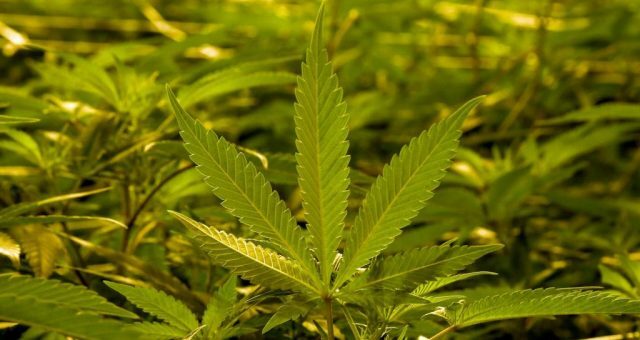 The couple came home with a positive pregnancy test after months of anxiously waiting. Their first ultrasound shockingly showed no children in Danielle’s womb, but her blood work definitely showed that she was pregnant. A couple of weeks later, their first baby could be seen through the ultrasound. And they eventually started seeing more babies in her womb. The number grew to five, and the first and only set of all-girl quints in the U.S. were born. Where Is the OutDaughtered Family From? The Busby family began when Danielle and Adam Busby tied the knot in 2006. The loving husband-wife duo met at Target back in Louisiana while they worked there. “Just kind of hit it off from working side by side, and we fell in love. I like to tell everyone our carts collided in aisle 5,” Danielle said in an interview. The couple is originally from Louisiana but moved to Texas after their wedding. All their girls were born in Texas, and Adam works there, too. 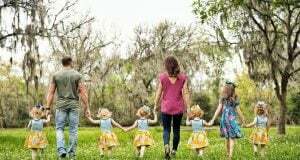 OutDaughtered is a TLC reality show about the Busby family. Mom Danielle is the first woman in the U.S. to have given birth to quintuplets who are all girls. The reality show follows the Busbys and their children, showing viewers all that comes with raising six girls at a time! The family-favorite show offers viewers an inside look at a family just like theirs but with five times the trouble! It is reported that Adam Busby is worth $300,000. We’re sure the family is making some solid money through the TLC show, as well as earning through social media and their own jobs. According to some leading job search sites, an accounts managerial job like Adam’s can earn him $77,000 annually on average. We know that parents of six children need more than that to live a comfortable life. So, we’re sure Danielle’s spinning class business helps them out financially. Not only is she the co-owner of Rush Cycle, but she also runs successful Instagram and YouTube accounts. The family’s website also offers shopping, and their blog site is pretty successful, too. Danielle shares all her experiences and candid moments of her life as a mother of six, which is great for fans who want more that can’t be seen on TV. It can also be calculated that Danielle earns a cool $900.00 per endorsed post through Instagram. She has been seen promoting products like Popsicle, Bend Soap Company’s Lip Butter, Rodan + Fields skin care products, and more! How Much Do the Busbys Get Paid per Episode? As far as reality TV shows go, there is no fixed income. That being said, the producers, like Terence Michael in this case, do set budgets for the shows. Michael said that OutDaughterd had a budget between $250,000 to $400,000 per episode and that the family makes about 10% of that. So, the Busby’s get a cool $25,000 to $40,000 per episode! How Can You Tell the Busby Quints Apart? While this might seem like a difficult task, it’s not all that difficult to tell the girls apart, even if you have never met them. They all have different natures and attributes, and some traits set them apart—looks and otherwise. Riley, who looks a lot like her father, Adam, and less like the other girls, is also known to have traits from her father’s behavior. She’s a go-getter and dominated her sisters when she was younger. The baby of the family is Hazel, and Adam is very protective of this little girl. She is the shy and quiet one, and also the only one who wears glasses. Parker is known as the leader of the group. She has shown her leadership qualities throughout her growth stages. Ava and Olivia are identical twins. Mom Danielle explained how she tells them apart in one of her Instagram posts. Is There a New Season of OutDaughtered in the Works? Yes, the new season of OutDaughtered is all set to air on TLC on July 11, 2018! The quints are back, and so is the Busby family. Last season started off after Hurricane Harvey hit the state. Thankfully, the Busbys were not harmed in any way. But Danielle Busby’s mother’s home was destroyed, and the Busbys are looking at helping her and the community at large.